Schroeder: Jumped before being pushed? The announcement by the German Chancellor, Gerhard Schroeder, that he wants to hold early elections is a sign not only of how serious the defeat in North Rhine-Westphalia is - but also of how desperate his position has become. It is not even clear how early elections can be brought about, since the German constitution makes hardly any allowance for them. Only if a chancellor loses a vote of confidence can the president dissolve the Bundestag (lower house of Parliament) and call new elections. The last time this happened was in 1982. Helmut Kohl was elected chancellor by the Bundestag, ousting the sitting Chancellor Helmut Schmidt. But he wanted his position to be confirmed by a popular vote - so called a confidence vote and got his own MPs not to support him. This enabled the Bundestag to be dissolved, and Mr Kohl to win the subsequent election. At the time the Supreme Court voiced serious criticisms of the procedure, doubting whether it was really in line with Germany's constitution. Lawyers are already working on how early elections will be brought about this time. But political analyst Lutz Erbring says there is no doubt a way will be found. "They've come out publicly now so they're stuck with it. There will be new elections." But it is less clear who would win, he says. 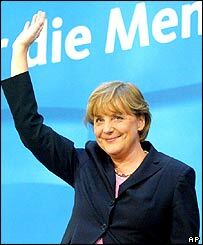 "In regional elections, people often vote to punish the government in Berlin. They may be more careful in 'real' elections to the Bundestag. This is perhaps what the government is hoping." "It's not a forgone conclusion the SPD [Social Democrats] would lose an election in the autumn by any means." But they will have an uphill struggle. In national opinion polls they are lagging well behind the opposition conservative Christian Democratic Union (CDU). The issues are also against them: economic growth is low and unemployment is at nearly five million - 12% of the workforce - which begs the question of why Mr Schroeder wants an early election. It may be that left-wingers in his own party, who are fed up with the painful economic and welfare reforms he has pushed through, have threatened to withhold support for him in the Bundestag. That could result in his government collapsing anyway - meaning Mr Schroeder merely jumped before he was pushed. In any case, the announcement was met with blank looks of shock at the SPD headquarters in Berlin. "This is political suicide," said an SPD delegate from southern Germany. "I'm furious about it." "It's going to be a complete disaster," added another delegate. It may be that the government also hoped to catch the opposition conservatives on the hop. The opposition is made up of two parties: the Christian Democratic Union (CDU) which runs candidates nationwide except in Bavaria, and the Christian Social Union (CSU) which runs only in Bavaria. 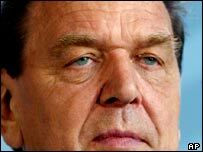 In the last general election, the CSU leader Edmund Stoiber was narrowly defeated by Gerhard Schroeder. He has still not ruled out wanting to stand again, annoying supporters of the CDU leader Angela Merkel - who feel she should run. The conservatives had wanted to settle the so-called "Chancellor-question" next year. Now, they have said they are going to do it this week. The velocity of German politics has suddenly increased a great deal.